• Fits belts up to 2”wide. • Fits belts up to 13/ 4 wide. -Fits belts up to 13/4” wide. its comfortably on my back at the horizontal angle. Sits kind of high when mounted on the right side of the belt vertically. Seems well made. Loops are wide enough for larger belts. Strap has plenty of length and can be adjusted accordingly or even removed. It’s a perfect fit, and I honestly don’t feel the need to use the retention strap even at a horizontal angle. 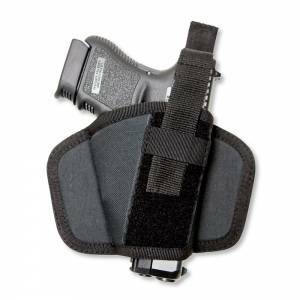 This is an innovative design, allowing you to carry in the small of the back or on your belt like a traditional holster. 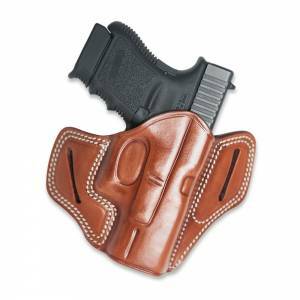 The holster seems well made, stitching and material are good, and the pistol, in my case a 1911 full size, is held securely in the holster, it will definately not slip out. Drawing and reholstering are easy from any of the positions available. Decent quality, it’s not going to fall apart, and it holds the gun in securely to the holster. It was a bit tight for my 40 S&W, but after a bit of stretching it now works perfect. Will not accomedate a lazer sight. could use an extra snap or Velcro safety. Very easy draw and fits perfect in SOB. • Fits belts up to 13/4 wide. • Fits belts up to13/4” wide. • The flat-back construction makes it comfortable for all day carry. 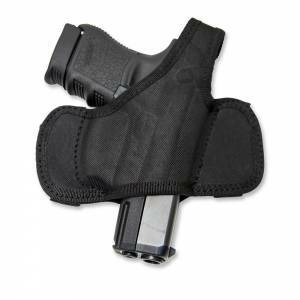 • The three slot design allows the holster to be carried strongside or crossdraw. • Adjustable thumb snap retention with velcro at the back side. 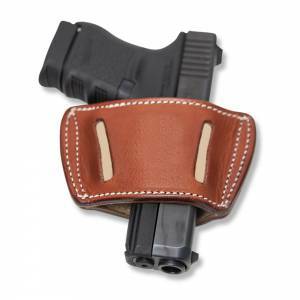 Great holster, well made and very comfortable. Securely holds my Glock in place. No real retention system other than the contour of the leather though. Would rate it a five if there was a stronger retention system. 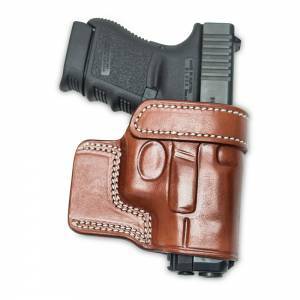 I really like this holster and am very satisfied with it. I couldn’t be happier with this! I actually ordered it for my XD-E and it fits like a glove! 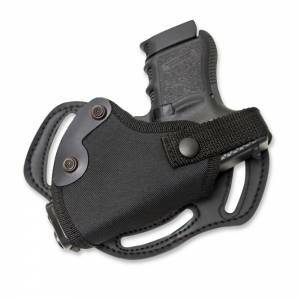 This is officially my new favorite holster, it’s total quality, if you’re looking at this holster hurry and buy it. 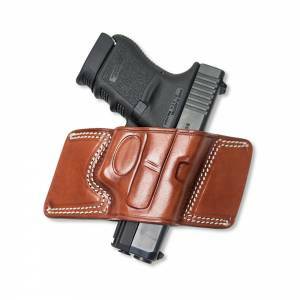 The holster is well made and fits my Glock 42 to snugly. 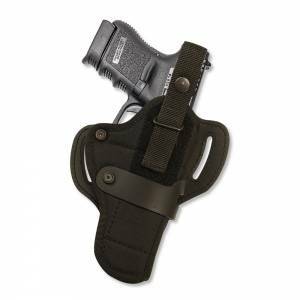 The holster fits close to the body and works well with a 2-inch belt. It took a little time to break in, but fits like a glove. 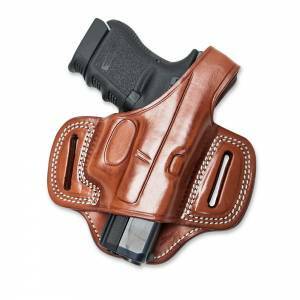 The holster is well worth the money and I will buy other Cebeci holsters for my other carry guns. 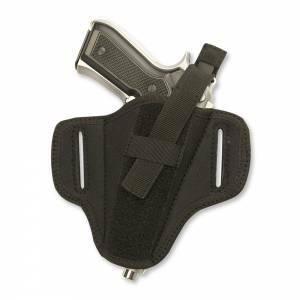 but prefer to avoid an inside the pants holster, this is a great option. Usually use Bianchi/Safariland holsters but thought I’d give this one a try because of the great price. 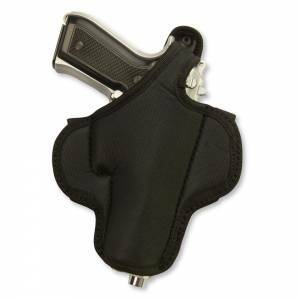 Very well made holster. Thick leather, heavy stitching, form molded to the Beretta Model 84. 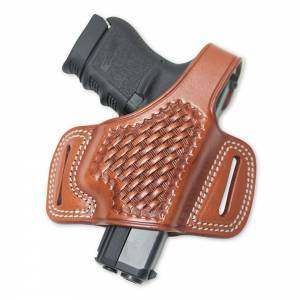 If there is anything at all I don’t like about the holster it’s that it is a LITTLE looser fit on the gun than I prefer. But not so much that the weapon is in any danger of falling out or anything like that. All in all, every bit comparable to Bianchi. No regrets. • Strong steel spring clip. This is my second Cebeci holster. I find them to be well-made, high quality, and very competitively priced. I am pleased with this purchase. 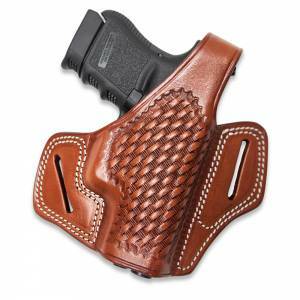 This is a terrific holster and holster design. It does hold my CZ 75B perfectly well and is just perfect for OWB with a shirt or jacket. It will be my “BBQ” rig for days I want to show of my pretty, “polished” friend. I suppose it should hold the 75 compact just as well, but not expose as much of the muzzle. The strap will hold with hammer back and fit nicely in front of it. works fully down also.The snap is very high quality and releases perfectly without a fight. No fears of it coming undone on it’s own. I thought the leather might be a little thicker, but it is still better than most. With a proper “large-footed” gun belt, you almost forget you have 3 lbs. hanging from your side! 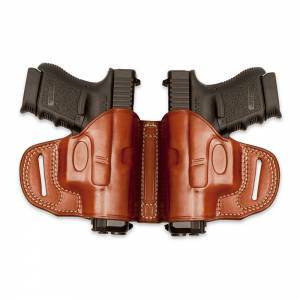 The Double-Stitching is strong and tight and the size of the holster is just right. Realistically it is worth almost double what Optics Planet is charging. Don’t be afraid, it is good! • Wear it 4 ways! • On the small of your back, as an FBI cant, crossdraw or on the hip. 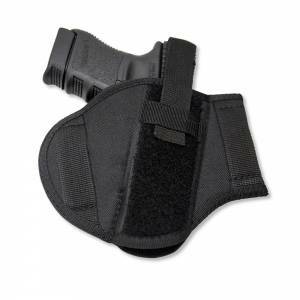 • Secure concealment, ready for fast action! Very happy with my purchase. It’s nicely made, medium weigh leather with nice finish outside and soft inside. Comes already formed, but some break in will be required for the PT92 because of the light rail. I have dozens of holsters. Believe me, I’ve tried them all. 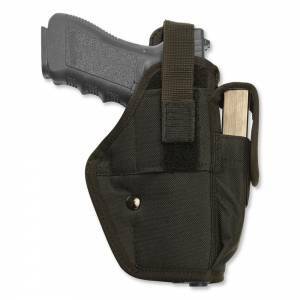 What I have spent a small fortune learning is that one of the best concealed carry solutions (unless you are tucking your shirt and no cover garment) is the pancake style holster. What makes them work is that the belt pulls them into the contour of our body and present a very thin profile. They are super comfortable and adjustable to specific carry positions on the belt. 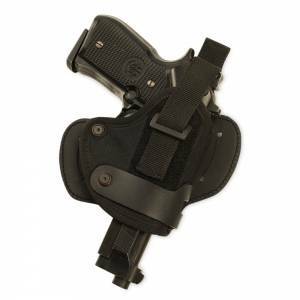 The Cebeci Arms holster is one of the top quality holsters I’ve bought. 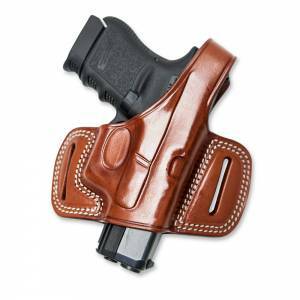 Great leather, excellent coverage of the gun. Pretty much everything I wanted. Didn’t know much about Cebeci when I started looking for a holster for my M&P but figured it was worth a try at the price, and saw some good reviews on line. Really happy with the look of it and the fit, we’ll see if it holds up though. So far it holds up to my old Galco. 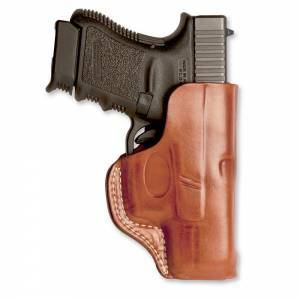 This holster for the money cannot be beat. 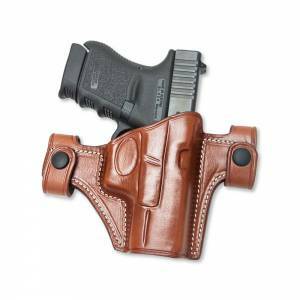 It is a quality made leathe holster that is gun specific. It fits like a glove and rides close to the body. 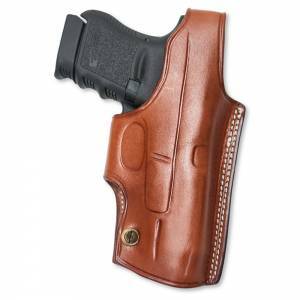 I was unsure what I would get at this price point as I normally spend $100+ for a quality leather holster. 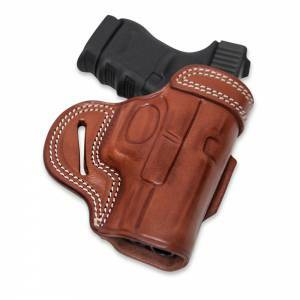 I have to say this holster competes with brands that cost 3-4 Times it’s price. I am very impressed. Don’t hesitate to buy one! Sweet piece of kit. High quality leather. 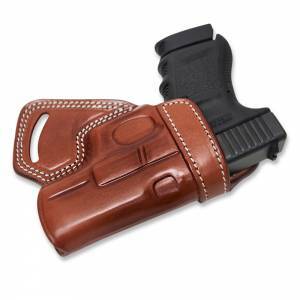 This holster fits my Sig Sauer 1911 w/ rails like a glove. The leather definitely needs breaking in at first, but it feels as good as it looks. Beautiful work, great leather, excellent product! This product holds my 1911 perfectly. 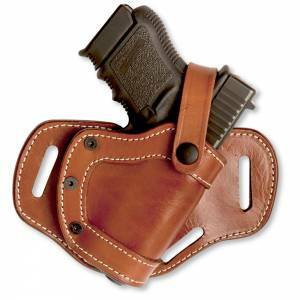 I would reccomend putting your belt through one loop, then a belt loop, then the other side of the holster, Makes it a much tigher fit. There was some difficulty getting the pistol in the holster, but as with all leather holsters, it requires a break in period. Would/will buy again. 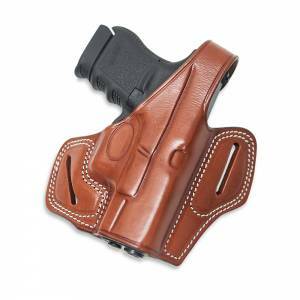 This is a nicely made holster for this price. The stitching is clean and neat, and the overall finish is very good.